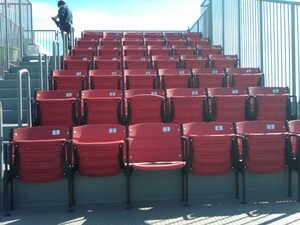 Skybox on Sheffield at Wrigley Field has recently installed stadium seats from S&S Seating! Skybox on Sheffield, one of the original Wrigleyville rooftops, is the choice for rooftop tickets and is considered to be the "can't miss experience" in Chicago! Skybox on Sheffield Managing Partner, Dave Abrams said, "The seats turned out great! We appreciate your help and professionalism."